Cool high-level sidetrek for the saga...works as stand-alone and has proper maps! This optional side-quest module for the Dungeonlands-saga clocks in at 37 pages, 1 page front cover, 1 page editorial, 1 page ToC, 1/2 page advertisement, 1 page RD, 1 page back cover, leaving us with 31 1/2 pages of content, so let’s take a look! 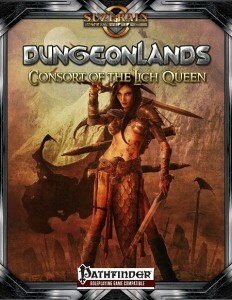 This module is basically a sidequest in the fight against the legendary Lich-Queen – but one that can have serious repercussions in Part III of the saga – hence, I’d advise the GM to use this module either during the trip through the Machine of the Lich Queen or as part of the journey towards her Palace in book III of the saga. This being an adventure-review, the following review, unsurprisingly, features copious SPOILERS. Potential players should jump to the conclusion. All right, still here? Only GMs around? Good! Once, even the fabled Lich-Queen Ayrawn was mortal and, as mortals are wont to do, she had a companion, a lover, a consort – an anchor, a chance for redemption, a man who would recoil from the darkened paths she embarked upon – this man was Horarion. When the angel Anat was sundered from the heavens and bound, the psyche of the lich-queen sundered Horarion’s mansion on Paxcetel, sending it spiraling towards the eternal Maelstrom, leaving, in spite of his arcane prowess, but a single portal, a tenuous connection to the lich-queen’s realm, a shining portal you can place at your leisure within the Dungeonlands-saga. Thus, Horarion remained in his isolated mansion – a place where arcane magic has its own weight, potentially inducing fatigue in casters and thus adding a nasty additional difficulty – and no, there is no means of escaping Pacetel here either – though the mansion’s challenges are pronounced indeed – when the stable master has a CR of 12 and a unique variant chimera has taken up roost in the stables, you’re in for a treat…and yes, there also is the Shalguath, a unique spirit ox to be found here. Death lurks at every corner here – Horarion has, for example, invested a part of his soul into a tapestry within his sanctum – and yes, the PCs may actually be eaten by the RUG in this room. Killer rug…explain that to your deity once you stand before them in the after-life…funny…and lethal. A storm of feral spirits locked away, a bathhouse containing a truly disturbing, unique aberration (including powers-granting waters) – lethal. Speaking of which – the empowered waste-disposal disintegrate trap is brutal indeed. The PCs can also do battle with spawning, supreme swordsmen and test their mettle against a unique taiga linnorm…And the vault of Horarion is no less lethal…and contains, among deadly adversaries, an unlikely item: A loom. This item is what makes the tapestry-versions of Horarion basically immortal and maintains the stasis of the islet – destroying the loom makes millennia catch up with the strange inhabitants of Horarion’s refuge – which btw. also include odd bark mummies and peris…and the destruction also makes it possible to defeat the three tapestry-bound Horarions, with each destruction providing a new power for a hero, though the types of said powers and their wordings have minor glitches – it’s e.g. “mind-affecting”, not “mind-effecting” and proper EX, SU, SP-codification would have been in order. Destroying the final tapestry unleashed what has become of Horarion – an undead baneful Noumenon, accompanied by unique hazards, as the house itself creates stony arms, weird roof-beam elementals animated by his power – a brutal boss fight that ends either in death or by learning what Horarion knew, gaining perhaps the most potent weapon against the lich queen…for the destruction sends the PCs back to where their journey to Horarion’s domain began. Still, it should be noted that the non-statblock elements, i.e. the hazards and precise presentation o the combat-relevant rules herein could have used a slightly tighter wording – as written, these components require some work from the GM. Editing and formatting on a formal level are very good, though, on a rules-level, there are a tad bit more glitches to be found herein than in the revised editions of the machine and place installments. Layout adheres to a beautiful 2-column full-color standard and the pdf sports numerous artworks in color and b/w, all of which are neat. The biggest surprise for me was the cartography: Horarion’s domain receives a beautiful, print-out-ready map that is player-friendly and thus offsets the largest point of criticism that plagued the dungeonlands saga – kudos for including that one! The pdf is a layered pdf that can easily be customized and also sports extensive bookmarks. Miles M. Kantir, with rules by Allan Hoffman and George “Loki” Williams, has created a truly interesting sidetrek for the main adventures of the Dungeonlands saga that actually is worth playing – beyond the delightfully twisted and diverse combat-challenges herein, this little module offers some truly interesting ideas and brims with creativity. Moreover, this adds a further dimension to the epic struggle against the dread lich-queen, one that is fun to partake in – though this module also makes for a great stand-alone module; you could conceivably run this simply on its own without a hassle and just some cosmetic reskins – and some of the brutal battles, including the climactic boss fight, definitely would warrant that. All in all, this is a great, fun sub-level of the epic journey through Ayrawn’s dungeonlands and one I’d certainly suggest getting, in spite of minor rules-language hiccups here and there – while some components in this module may frankly be more precise, the good components still stand out – hence, my final verdict will clock in at 4.5 stars, rounded down to 4 for the purpose of this platform. Do you prefer Savage Worlds rules? You can get that version here on OBS!